How are you owners feeling after your first week on the waiver wire? Better get ready because we have another week to hit these waivers hard. We saw a ton of points scored in Week 3 and saw Calvin Ridley go #Kaboom. So who you are going to add this week? 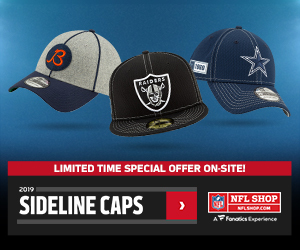 Stay ahead of your bye weeks. In Week 4, we have the Panthers and Redskins on bye weeks. Week 5 we have the Buccaneers and Bears on bye weeks. Without further ado, here are your waiver wire targets for Week 4! I spoke highly of Dalton in his Week 3 matchup at Carolina and for the most part, he delivered with a solid fantasy performance if not for all of his interceptions. He still threw for over 350 yards, and his matchup in Week 4 may be the best you can find on the waiver wire. In Week 4, the Bengals will be taking on the Atlanta Falcons who are absolutely decimated on defense. The Bengals will be going to Atlanta in this Week 4 matchup so expect points to be scored with the Falcons playing at home. 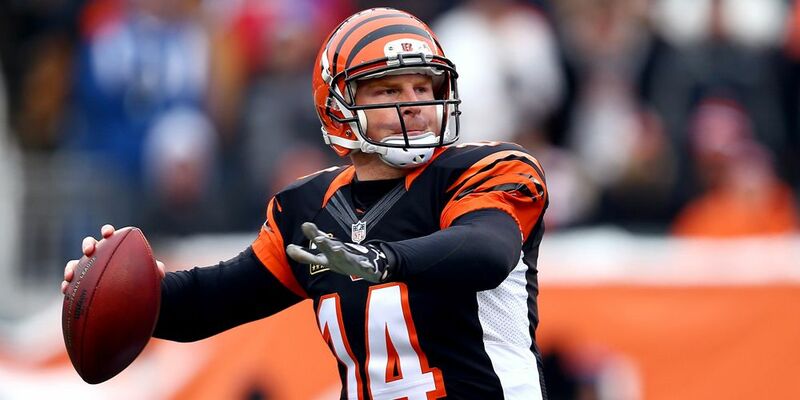 Start Dalton confidently against the Falcons who have allowed the fourth-most fantasy points to the QB in 2018. The new starting quarterback for your Cleveland Browns is Baker Mayfield. The energy he brought to the Browns increased everybody’s production around him. For fantasy purposes, he is worth an add in most fantasy leagues. He threw for 200 yards in essentially a single half against a Jets defense that had played very well during the first two weeks of the season. In Week 4, the Browns will take on the Raiders who just allowed a 25 point plus fantasy day to Dolphins quarterback Ryan Tannehill. 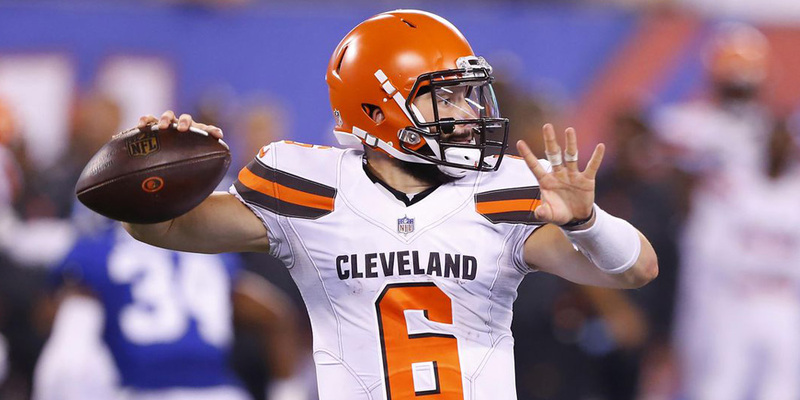 We have seen rookie quarterbacks time and time again produce in fantasy football, and what inspires hope for Mayfield is he actually has offensive weapons. There are only two things you need to know about Tannehill entering Week 4. In his last four starts against the Patriots, Tannehill has averaged over 345 passing yards and 1.25 passing touchdowns. And that Patriots defense through the first three weeks? They have allowed over 20 fantasy points per game to quarterbacks. Solid stream for Week 4. 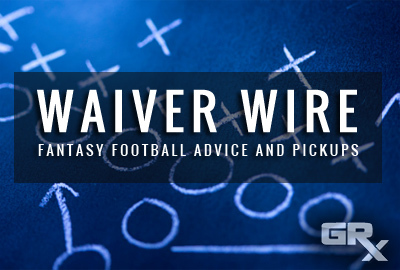 The running back position is by far the hardest to fill on the waiver wire. 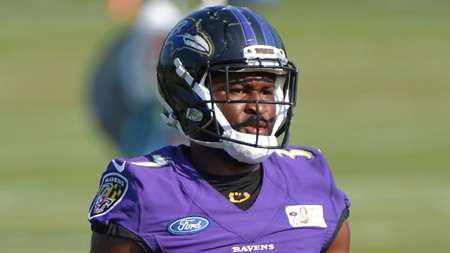 This week is tough sledding with very limited options outside Buck Allen. He needs to be owned in all fantasy formats. In PPR formats, Allen has scored double-digit fantasy points in every single game this season. He is currently ranked as top-twenty running back based on his total points. He has 17 targets through the first three games and he has scored four touchdowns. If for some reason he is still kicking around the waiver wire in one of your leagues grab him! The Colts backfield is a mess, but in PPR formats Hines is your best bet on the waiver wire. My reasoning behind this? His snap usage. Through the first two weeks of the season, Hines played in less than 46% of the offensive snaps. In Week 3, his usage increased to just under 73% of snaps played. He is tied for the third most in total targets on the Colts and has a solidified role in the passing game. How about those Buffalo Bills? Upset of the week and Ivory of all the Bills offensive skill players made the most impact in Week 3. In back to back weeks now Ivory has scored double-digit fantasy points in PPR formats. With the Bills showing new life under rookie quarterback Josh Allen, Ivory is an interesting add in deeper formats especially with LeSean McCoy’s availability still up in the air for Week 4. If Ivory ends up starting, he could be in for a very productive outing against the Green Bay Packers. They were absolutely gashed last week by Adrian Peterson. 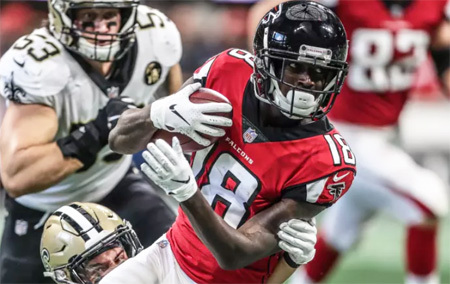 Calvin Ridley already has more touchdowns in three games, than Julio Jones had all last season. One of the most basic strategies in fantasy football that works very effectively is to add players that are attached to an elite offense. After these last two weeks, the Falcons offense sure looks elite, especially with their defense being picked apart on a weekly basis. Ridley is the first rookie since Odell Beckham Jr. to catch three touchdowns in a single game. He is obviously talented as previewed in an offseason article I wrote on Calvin Ridley. With the upcoming schedule extremely favorable against the Bengals, Pittsburgh, Tampa Bay. and the New York Giants before their bye week in Week 8. Keep in mind that if the Falcons offense falters off perhaps on the road this season Ridley’s production could take a hit. He still ranks third behind Julio Jones and Mohamed Sanu in terms of snap usage through the first three weeks. Williams in three games this season has either had at least 81 receiving yards or has caught a touchdown in each game. He is my favorite addition this week because Williams has separated himself as the number two wide receiver for Philip Rivers in Los Angeles. He has shown big-play ability and red zone upside through the first three weeks of the season. His upcoming schedule is also super favorable. In Week 4 he faces the San Franciso 49ers who have allowed the 8th most fantasy points to the wide receiver position. They have allowed either at least 50 receiving yards or a touchdown to multiple wide receivers through their first three games. The rest of his schedule is Oakland, Cleveland, and then Tennessee before their bye week in Week 8. In back to back weeks, Tyler Boyd has proven who the number two wide receiver on the Bengals’ depth chart is. 12 catches, two touchdowns, and over 200 yards receiving Boyd is a solid fantasy asset. It’s pretty common to see wide receivers break out in their year, so we could be witnessing just that. Boyd leads the Bengals in offensive snaps so far in 2018, and there is a chance that A.J. Green may be limited in their Week 4 matchup versus the Falcons with a groin injury. Should Green miss time, Boyd would be in line for an even more increased workload. Callaway saw his workload significantly increase in Week 3. He had ten targets which ranked second on the team behind Jarvis Landry (15). Callaway’s snaps have increased from 16.85% in Week 1, all the way up to a team-high 89.61% in Week 3. Besides his increased workload the other reason why fantasy owners should be optimistic about Callaway is that of his matchup in Week 4. The Raiders defense through the first three weeks has allowed the second most fantasy points to the wide receiver position. What really drives Callaway as a potential sleeper this week is that the Raiders average depth of target allowed to opposing offenses. The Raiders have allowed an average depth of target of 10.3, second highest in the NFL. This team can be beaten deep and that is exactly what Callaway brings to the table. Dropped in a lot of leagues after his slow start, Shepard should see a significant workload increase with the injury to Evan Engram. Shepard has played over 95% of the snaps in back to back weeks and saw his targets bump up to seven with a touchdown reception in Week 3. Shepard will definitely be third in the terms of target market share entering Week 4 versus the Saints which is an excellent matchup. The Saints have allowed the most fantasy points to the wide receiver position by a significant margin. They have allowed 66.6 fantasy points per game to the wide receiver position. The next closest is the Raiders who have allowed 51.4 fantasy points per game to the wide receiver position. The Saints specifically also have been terrible against number two and number three wide receivers. DeSean Jackson, Chris Godwin, Antonio Callaway, and Calvin Ridley all had productive outings versus the Saints. Courtland Sutton season is coming soon. Obviously, this is another example of a stash for a player, but it is important to not the margin of offensive snaps is closing between Sutton and Demaryius Thomas. In Week 3 the gap of offensive snaps played was just a 2% difference (79% vs 77%) in slight favor of Thomas. Thomas has looked less than stellar this season and it may just be a matter of time till the Broncos work their rookie wide more in. 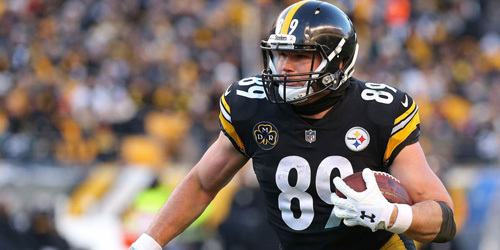 “As much as I wanted Vance McDonald to be a thing it does not look like it is going to happen anytime soon.” – From last week’s article. Look’s like anytime came sooner than I hoped! McDonald finally had the game that fantasy owners were looking for in Week 3. The explosive tight end finished the week as the number one tight end in fantasy. Finally healthy, McDonald is the best addition at the tight end position because of his big-play upside. He is the alpha in the tight end room when healthy over Jesse James and should be played accordingly in fantasy football. Even with the absence of Jack Doyle and 11 targets, Ebron failed to produce a productive fantasy day. However, his team-high eleven targets should keep fantasy owners optimistic about Ebron if Doyle continues to miss time. Don’t drop him and if somebody does, add him. Amazing the things you can do when you are healthy. Eifert finally looks to be getting his health back as he has seen his usage increase in the offense. In Week 3, Eifert played in 64% of the snap which ranked third highest on the team. Similar to Tyler Boyd, if A.J. Green misses time or is limited Eifert could be a great tight end to start in Week 4 against the Falcons. The Falcons have allowed the sixth most red zone targets to the tight end position so far in 2018. They also have lost starting safety Ricardo Allen, potentially creating an even better opportunity for Eifert to produce. Njoku has done basically nothing since the preseason, but with the change at quarterback, there is hope for the Miami product. Baker Mayfield heavily targeted his tight ends while at Oklahoma and it would just make sense that Njoku would see a boost from the new quarterback. Not necessarily starting Njoku, but it is worth the add with the tight end position being so tough to navigate through. The analysis of Ben Watson is simple. He plays on currently one of the highest fantasy scoring offenses in the NFL. Put up a respectable five receptions for 71 yards in Week 3 and there is no reason Watson cannot continue to put up those types of numbers moving forward in an offense like the Saints. The Chargers are playing at home against the San Francisco 49ers and C.J Beathard. Chargers defense is available in a ton of leagues so grab them if you can. The Packers are playing at home against the Buffalo Bills and Josh Allen. Allen fumbled three times last week and will surely create turnover opportunities for the Packers D/ST. The Seahawks are playing on the road against the Arizona Cardinals and Josh Rosen. Rosen may be an upgrade from Sam Bradford, but until he proves himself in the NFL, defenses need to be streamed against him and the Cardinals offense that has been disappointing thus far in 2018. – Andrew Erickson is a fantasy writer for Gridiron Experts. Follow me and vote in my twitter poll!